It is all too easy to impress the present onto the past. Especially in cases where there has been an attempt made by contemporary architects to ‘nod’ to a prior building that once occupied a lot. 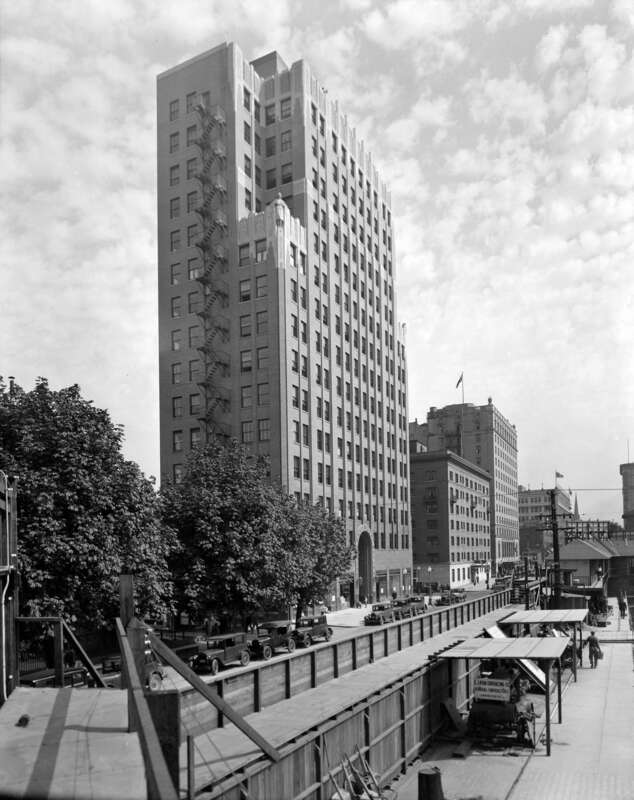 A good example of this is the Georgia Medical-Dental Building (MDB, hereafter; 1929; McCarter & Nairne, architects), which was demolished by implosion in 1989, and the Shaw Tower at Cathedral Place (SCP, hereafter; 1991; Merrick, architect), which stands on the lot today. When I recently happened upon the image above, I was initially disturbed by the apparent narrowness of the Medical-Dental Building. It appeared to me to be only half as wide as it ought to be. 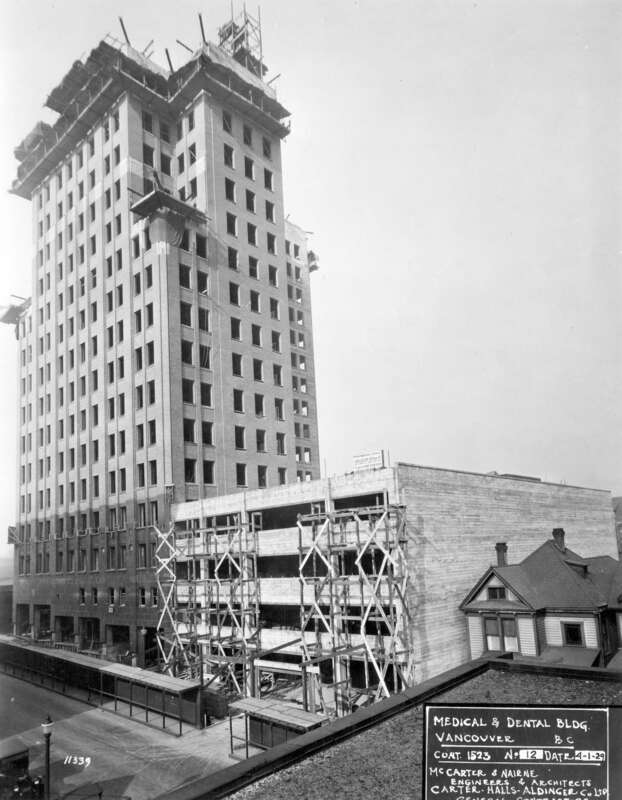 At first, I thought that perhaps when work started on the structure, the economic downturn of the Great Depression forced the builder to focus on building just the southern slice; that the northern half would be built later to create the square footprint that I assumed was ‘natural’ for the structure. The next image revealed my error: MDB had an ‘L’ footprint, not the square one that I’d assumed it would have. My assumption was due, in part at least, to my expectation that the older building would have had the same sort of footprint as today’s SCP has. VPL 12176 View looking east at the Georgia Medical-Dental Building from Burrard Street; this reveals that the structure had an “L” footprint, not a square one. 1930. Frank Leonard photo. CVA 99-3749 – Georgia Medical Dental Building at Northwest Corner Georgia at Hornby. 1929. Stuart Thomson photo. MDB had a blunt roofline with lighter bricks near the roof to contrast with darker brickwork below. 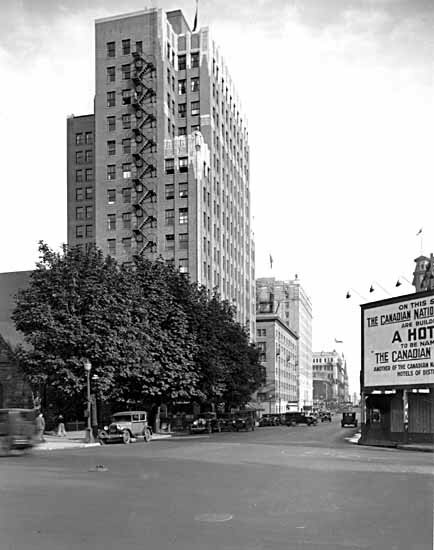 SCP has a chateaux-style roof (which, together with the griffins, is probably a nod to the architecture of its near neighbour, the Hotel Vancouver). 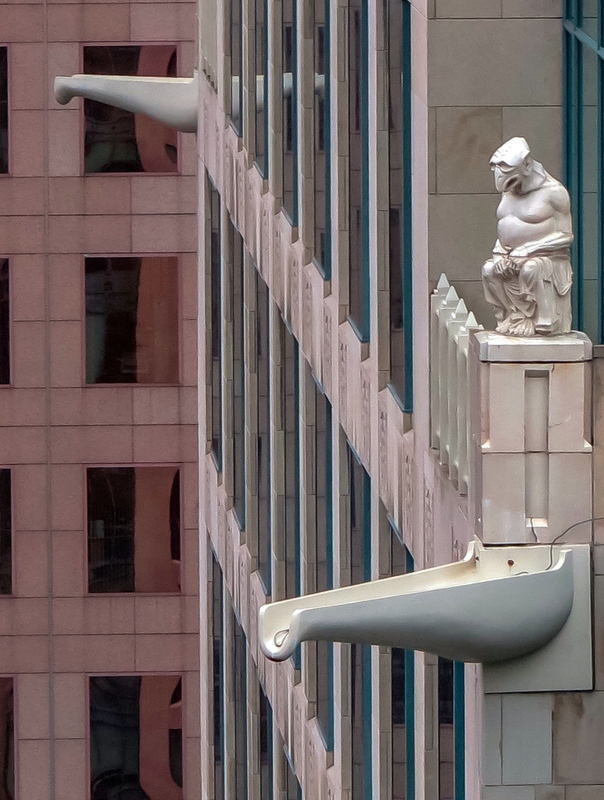 A Griffin and Other Ornaments on Shaw Tower at Cathedral Place (taken from Hotel Vancouver). c2013. Author’s photo. This entry was posted in Frank J. Leonard, street scenes, stuart thomson, yesterday & today and tagged bc, georgia medical-dental building, georgia street, history, hornby street, Shaw Tower at Cathedral Place, vancouver. Bookmark the permalink. That’s interesting – I’ve only ever seen the southeast view which makes the building look square – I too am surprised to learn it’s L shaped! I’m pleased that you found the post insightful. Thanks for commenting! I cried when the old building came down. I couldn’t go by it without thinking of my dad. When I was very young and we went to Vancouver (from New West; a big adventure in the 1950’s) he always used to recite the names of the ” reah”sisters: diarrhea, gonorrhea, pyorrhea and seborrhea on the building. I wished they had left them off. Thank you for commenting. I’ve noticed at at this site that there is a chance that at least one of the 5000-lb sisters was saved at “the Hastings yard”. Intriguing. If you look at the image at the top of the post, there is no sign of the two sisters who should be on that side of the building, so perhaps they were removed before the demo! The original sisters were indeed saved, and are now installed on the Technology Enterprise Facility III building on the UBC main campus. Thanks for letting me know this! And thank you for reading and commenting on VAIW.